Men’s trunks are by far a versatile underwear that any guy should own if you’re looking for the undies to wear for every occasion, from casual to formal wear, from everyday wear to moderate sports. They figure smaller inseam than the boxer to show nothing out through your suit pants whilst the fitting is a bit tighter to prevent bunching up, giving a professional look for your work life. At the meantime, it’s slightly shorter than the boxer brief underwear to give more comfort, coverage and support to put on. From that point, if you want to make a plot twist in your underwear collection, not the briefs, but just something else with better performance, try these. 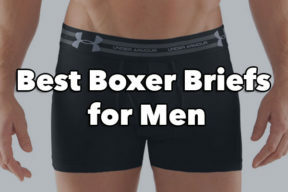 If that idea is still in your mind because you have no idea of which brands to go to or how to choose the best men’s trunk underwear, this round-up collection with my favorite picks with some guideline will help you put that thought into action. Read on! Speaking of these, my recommendations are always Calvin Klein – the king of men’s undies, and next is adidas. They aren’t getting famous because of nothing! These two are high-end brands for not only the high-quality materials invested on each line, but also the precise cutting to excel your experience rather than other affordable ones. Might you still not understand what I’m talking about, so let’s dive into each one. First off is Calvin Klein, or CK! 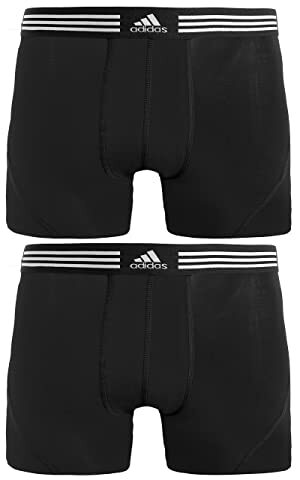 This micro modal is my choice of all the time for work or moderate sports like football or basketball because of its superb elasticity, softness and comfort provided that keeps me feel super convenient, dry, and support all day long. Yes, all day long without bunching up on my thighs, or tightening my waist, or feeling damp down there. Even if I sweat a lot under the hot temperature of summer days, or during those business trips that I have to move more than usual. My guess is, the combination materials between lycra and modal wins the game. They are not only elastic, wicking moisture quickly, but also durable enough that you can machine wash them with worry free of wears and tear. Just remember to wash them in cold water and natural air dry to maintain its shape longer. But the best thing about this underwear is its contour box. You know the biggest drawback of trunks are their accentuation of portly figures, but this isn’t the one. On the contrary, their contour pouch flatters physique to keep the most professional look. In terms of price, they are affordable for the quality, at least in my point of view. There are three options for you, pack of one, of two and of three. The more you buy, the cheaper. So, the choice is yours. Just remember to choose the right size (Go true size, guys!). 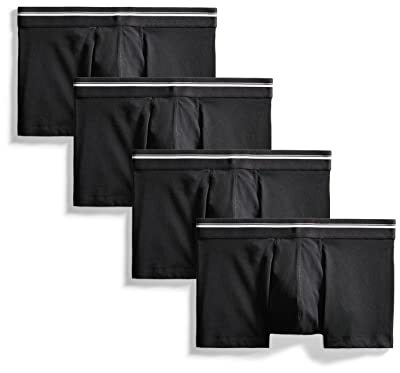 If your private section’s skin is sensitive and “they” prefer absorb moisture rather than wicking it, my suggestion is this pack of three CK men’s low-rise trunk. They are made mostly of cotton with some elastane to provide moderate elasticity and fitting. This additional substance also helps the underwear itself more durable and support, such as its machine wash ability, or the comfortable waistband that you hardly feel tight or it leaves some unwanted marks on your skin. In terms of length, compared to the men’s trunks above, these ones are a little bit longer but don’t worry, that just provide more coverage to you without bunching on or rolling up. Besides, another thing that I particularly love in this line is their diverse colorway options. If you are a collector, these ones surely fit the bill. 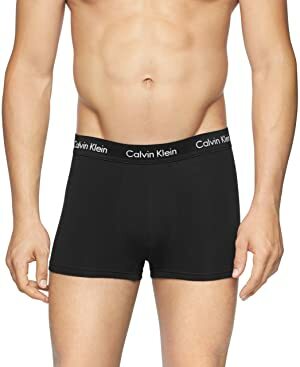 About the size chart, if you used to have problems with fit, either too small or too big, feel ease in mind when choosing this CK trunk underwear because they 100% go true size. Take note that, over time, they obviously stretch out a little bit, but in forming your body line rather than in a SAGGY WAY. Big thumb-up! Might I not have to talk much about this well-known athletic brand, but just need to bold the truth that their underwear line is super comfortable and suitable for sports. Chosen from the finest cotton material, there’s no strange that these trunks are outstanding for their moisture absorption. 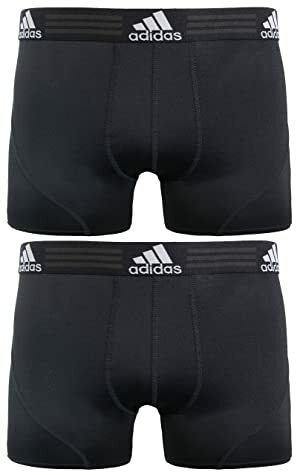 The biggest strength of cotton underwear in athletics is they not only provide me the best comfort, but also prevent me from unwanted odor, holding my confidence up all the time no matter I’ve just end a basketball match. Plus, the additional spandex plays its best role in elasticizing the underwear itself, fitting more perfectly to your bodyline and plus, cutting off much heft for the trunks. Besides, is its coolness and durability. In fact, you can machine wash these trunks, like Calvin Klein’s. A bit unrelated, but this model comes up with almost nonexistent pouch, which is also a perfect choice for women who would like to stay away from women undies. Or, these are the perfect choice as couple stuff. 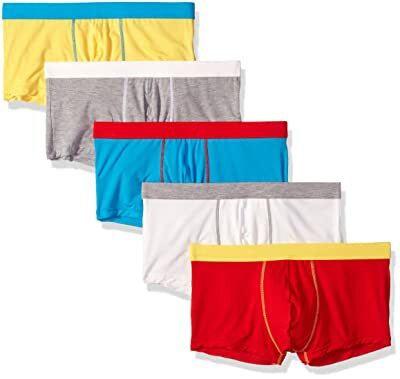 Lastly, great price for superbly comfortable, durable, long-lasting underwear, made by well-known brands, at only under $17 a pair. For harder sports, under heavy sweating conditions, these trunks are my recommendation for you. They are made out of 91% polyester and 9% spandex – all popular manmade fabric with great ability of moisture wicking. Opposite to the cotton underwear that absorbs moisture, these ones wick moisture away to keep the undies themselves dry out quicker whilst you feel cool all the time without annoyance of wetness. Plus, this combo gives the underwear lightless that sometimes, you might not notice them down there. And finally, their decent fitting causes no riding up or bunching on your legs as well. Another strength is the soft tag-less waistband with smooth stitching that you get no more annoyance or discomfort of painful skin marks caused by the rough logo tags. It neither leaves sweat marks on my basketball shorts nor makes them become drenched. However, they are only good at athletics, which means if you wear them under your suit pants, in those hot summer days, there might some unwanted sweat marks. 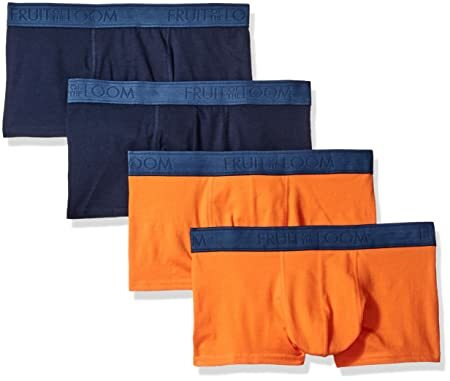 Fruit of Loom is a popular mid-tier men’s underwear brand. Their products’ quality is fine, but might slightly different between patterns. Some fit just great to my bodyline whilst the other patterns are a bit looser and fitting longer. In terms of this pack (You’ve got two choices: pack of 2 and 4), I highly recommend choosing the gray ones. Their performance is more decent than other colored and striped, fitting more like trunks whilst the rest is more about a brief. That’s the one and only drawback about these Fruit of the Loom Trunk Underwear. There’s no remorse about their durability, comfort, or ease of movement. They are made mostly of cotton with a bit spandex so that the moisture absorption ability is phenomenal to leave neither sweat mark on your pants (even the suit pants) nor annoyingly wet feeling on your skin. Highly recommend for casual wear or work wear. Two other bonuses are their tag-less and plushback waistband for the most comfort during a whole day long. No skin mark after all. And, they are well wear-resistant to intact its original shape for months of use no matter how many times they are machine washed. Overall, very satisfied! Another affordable men’s underwear that you should consider is David Archy. I appreciate their material combination because the major ingredient is bamboo rayon that if you already read my article about “Best Men’s Pouch Underwear 2019”, I’ve already talked detailly there. In brief, bamboo rayon underwear is a must-try because of two greatest benefits: soft and anti-bacteria. That means not only your boys feel so good and comfortable down there, but they also get no unpleasant smell as well under heavy sweat conditions. In comparison, I personally find that the silky touch of bamboo rayon fabric is just after the genuine high-end silk. And, another similarity between both of them is the ability to adjust temperature, which means keep you cool in the summer whereas cozy in the winter. Aside from fabric, their design is very sophisticated that you don’t need to adjust “them” all the time during the day like other kinds of underwear. Another strength is waistband, very comfortable without rolling down or leaving marks. Finally, is the 3D pouch. It’s not sticky whilst keeping you feel comfort all day long. The seamless stitching is perfect for both casual and formal dress as well. Last but not least, you can machine wash them. Speaking of David Archy, I provide you two major kinds – with or without fly. The above trunks get no fly whereas this one does. The choice is much based on your preference. The extra separated fly area gives you extra space for comfort because now, your package can stay dried all day no matter how many times peeing. Particularly in this model, there’s a breathable panel that let air flow freely so that you won’t feel sticky to adjust them all day embarrassingly. Speaking of materials, this one is quite different from the David Archy above as it’s crafted from a combo of ROICA spandex and lenzing micro modal. For those who don’t know, micro modal is an absorbing moisture fabric so that it won’t leave no moisture marks on the outer pants, which means a good idea for skinny jeans or suit pants. I highly recommend this kind of material for office men who have to sit for hours every day or athletics people who usually take part in many outdoor sports and activities. And ROICA spandex, it’s a high-quality elastic material to keep the underwear itself fit like a glove to your bodyline. Usually, it’s used in waistband to prevent rolling down unwantedly. Along with that, the seams are what I really appreciate because no matter how many times I machine wash them, from time to time, they still look like new without wears and tear. Just one thing to take notice is the different color due to some small upgrading from David Archy. So, if you used to buy this product before, don’t be amazed and both versions are the same in quality. Italian items are famous for their sophisticating making process and that’s why when hearing these Kronis men’s trunks are Italy made, I bought them right away to see how “sophisticatedly made” it will be compared to other kinds. It does be more comfortable! And, after nearly a month of use, I found such that comfort derived from two things: material and cutting. The kind of material utilized in this trunk is the premium 180GSM Brushed Cotton Blend – something that hardly can you find on other USA-made underwear or somewhere-made ones. It nails up the phenomenal comfort, breathability and softness with lots of support for a day of work or playing sports outdoor. Particularly, it’s 100% manmade underwear. Wow! I’ve heard of much handmade stuff but this is my very first time there’s handmade trunk. But the price can’t be more affordable! For less than 20 bucks, I’ve got two trunks and there are 4 different packs with various colorways to choose from. Also, don’t forget to choose your size (Go true size if you’re a Western guy and one size smaller for Asia guy). The more units you buy, the cheaper! Unlike other fly underwear that usually give you a gap for insecure feeling, this one comes up with a double-ply pouch on up the center and both sides to deliver the most contoured and supportive look so that you can feel really snug. Thanks to the seamless sides, it’s possible to wear underneath dress pants or suits as well. The final bonus is its waistband – very elastic and comfortable to ensure fitting your bodyline without rolling down whilst leaving no marks on your skin. Love it! If lucky, you can find some super-good deal on this Wirarpa pack of four trunks. Highly recommend for teen boys or young people who have tight budget but quality isn’t forgotten. How good is the deal? On some certain patterned, sized Wirarpa trunk underwear, a pack of four just costs around 6 bucks whilst the “most expensive” pack is roughly 24 bucks. Unbelievable, right? To provide such competitive price, the manufacturer chooses the combo of modal microfiber and spandex to cut off the cost whereas ensuring the highest quality. Aside from affordable, this material blend is also lightweight, soft, stretchy, breathable, and durable than cotton. Plus, they come up with silky hand-feel. The same with its waistband, but it fits tighter to make sure there’s no rolling down or getting loose after a couple of use. On top of that, they’re durable enough to machine wash.
Two other strengths of Wirarpa underwear are shorter leg design to prevent bunching on or rolling up your thighs and the contoured U pouch without fly area to keep your junks more comfortable with no need of adjustment during a day like other poor-design trunks. Importantly, leave no stickiness to your sensitive areas. If you love minimal men’s trunk underwear with budget price, this is your best bet. It comes in three basically colored pack options, including black, navy and white. The same with its design – Instead of printing the brand logo as big as possible like other heavy logo companies like CK, Adidas or David Archy, with Goodthreads’, there are just two stripes, one small and one bigger laying parallel on the waistband, making the whole look very minimal yet boring. Nice! With seamless sides and short inseam, they are hard to exposed through your outer trousers, especially in formal clothes. Besides, the material combo of cotton and spandex without fly, but just a contour pouch keeps you comfortable with no adjustment needed or sweat marks on your suit pants, making very professional outlook. Plus, very low maintenance. Highly recommend for office guys! For those dudes who love playing with colors, this colorful set of five Astarin men’s low-rise trunks might be the best bet for you. It’s suitable for people who don’t intend to pay much on underwear for casual wear or in tight budget. Even, it’s versatile enough to take advantage on those formal occasions like interview, business trip or office life while the price is super-affordable. It’s as cheap as the Wirarpa’s above, with the same material ingredients, but just different in color options. So, from the feeling touch to wearing experience, they are much the same – very soft, affordable, stretchy and comfortable. Also, don’t worry about the waistband – they are great fitting to my bodyline without rolling off. Just one thing to keep in mind when choosing the size of this trunk is if you’re a Western guy with standard figure, go for two size up for the best fit. If you’re a fan of bamboo material but looking for more affordable option, this set of five Jinshi men’s trunks surely fit the bill. Have heard a lot about Japanese companies with how high-quality and sophisticated of their products so I bought this pack with lots of expectation. Luckily, it doesn’t disappoint me! With 95% bamboo fiber, they are decent in moisture absorbing to keep me cool and dry all day without leaving sweat marks on the outerwear. Plus, 5% spandex in the waistband keep it stay in place without rolling off or bunching on uncomfortably. Also, no marks left on skin. The best thing is no odor, thus, aside from wearing for casual and work, it’s perfect for sports as well. If your skin is sensitive, this set is even worth a try because there’s no tag on the backside of its waistband. Itchy-free is sure! However, as this is Asia-made underwear, if you’re a Western guy, don’t forget to choose at least one size up for the best fit. Other than that, there’s no complaint on it! In generally, these 12 suggested men’s trunks are my top favorite collected from time to time. I hope such diversity in styles, material blends, purpose of use, price range as well as my personal reviews included help you find out the most suitable one.